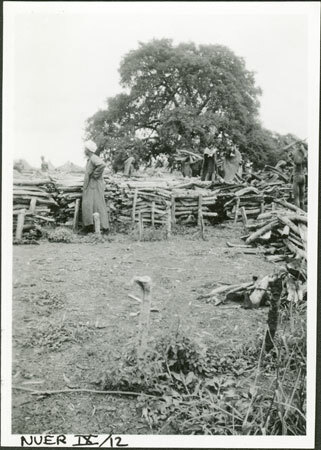 A man with an arab headdress standing next to a fuelwood station for river steamers, probably on the Sobat in 1935, with Nuer men putting logs onto a leather or textile section to carry away to a boat as a bundle. This image was probably taken by Evans-Pritchard whilst stretching his legs at a fuel stop en route to or from Nasir. Note on print reverse ms pencil - "40 3" & print front border ms ink - "NUER IX/12"
Morton, Chris. "Fuelwood in Nuerland" Southern Sudan Project (in development). 03 Jan. 2006. Pitt Rivers Museum. <http://southernsudan.prm.ox.ac.uk/details/1998.355.403.2/>.